If you’ve got a piece of art or a special photo you’d like to display, but the cost of professional framing is hanging you up, you might try doing it yourself. 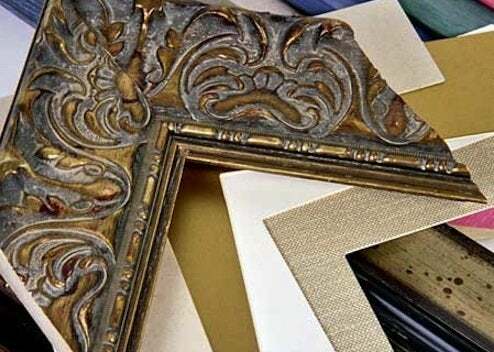 You can have the frame rails and stiles, glass, and mat cut for you at home-and-craft centers, but picture frame molding, glass, and mat material are also available in lengths and sheets for you to cut yourself. You’ll need a miter saw or a simple miter box, a mat cutter, and a glass cutter. If you’re doing a lot of frames, consider springing for a miter corner clamp as well to make the job easier. Once you’ve carefully measured and bevel-cut the mat, secure your art piece to the back of it with acid-free tape. Glue, fasten, and clamp the corners of the frame securely. Clean the glass and insert it; add the matted art and a backing sheet; and secure it all with glazing points. And glue a sheet of craft paper over the back to keep the dust out. Opt for acid-free materials and UV-filtering glass whenever possible to keep your art from yellowing over time.